Above: LL Cool J performs "Mama Said Knock You Out" on MTV's Unplugged. Nineteen years ago today, on May 1, 1991, something extraordinary happened on cable television. Rapper LL Cool J appeared on MTV's "Unplugged," performing his then hit, "Mama Said Knock You Out" with such intensity and power, that it was impossible not to discuss it the following day. People still remember the performance today, for both its novelty and the fact that you could see the shirtless L.L. Cool J's white underarm deodorant. He blew away the other acts that appeared on the half hour show that evening, those being De La Soul, MC Lyte, and A Tribe Called Quest, none of whose performances are remembered nearly two decades later. Introducing his two song set (which included also included a groovy version of "Jingling Baby," which he played first), LL Cool J noted that the performance was "going to be a smooth thing, but it's also going to be a rough thing, it's going to be a real big thing, it's gonna happen in a big way." Another recent installment showcased the rap and hip-hop acts L.L. Cool J, De La Soul, MC Lyte, and A Tribe Called Quest. Hip-hop, with its reliance on computer sampling, record scratching, and vocal enhancement, is commonly thought to be the pop form most dependent upon technology, but this edition of Unplugged reminded viewers that the music is rooted in doo-wop and rhythm & blues. The show was uneven — A Tribe Called Quest performed halfheartedly, and De La Soul proved themselves the novelty-act jokers that some of us skeptics have always suspected. But MC Lyte performed her song ''Cappucino'' like a rapping Aretha Franklin: Lyte brought out the soul in her lyrics. And L.L. Cool J was extraordinary, turning his ''Mama Said Knock You Out'' into a new kind of vocal music that had the emotionalism of the blues and the relentless catchiness of rock. Four leading rap acts - De La Soul, LL Cool J, MC Lyte and A Tribe Called Quest - appear without their usual turntable backing tracks or samples. They rap live, backed by a real band. The band is called Pop's Cool Love. The beats don't come from a drum machine, they come from a drummer. There's acoustic and electric guitar, bass and piano. Pop's Cool Love does its job well: The rhythms are solid yet flexible, allowing the rappers to feel comfortable with the beat and find a groove. The rappers acquit themselves well, although the brevity of the half-hour program doesn't allow for more than token performances. The three members of De La Soul seem much more focused onstage than they did in their disappointing concerts a few years ago. They performed a confident, self-contained version of their new single "Ring Ring Ring," a telephone song in the grand tradition of the Marvelettes' "Beechwood 4-5789," Freddie Cannon's "Buzz Buzz-A-Diddle-It" and Chuck Berry's "Memphis." A Tribe Called Quest's "Can I Kick It" with acoustic guitar backing and MC Lyte's "Cappucino" both get across without the usual augmentation. Lyte was especially good - she seemed to get caught up in the spontaneity of the show, and was on the verge of bursting into a spirited improvisation when the song ended. Yo' MTV Raps will have a special on tomorrow, Wednesday, May 1, 1991 at 7:30pm EST. It will be a special Rap Unplugged. The guests will be L.L. Cool J, De La Soul and A Tribe Called Quest. Can you imagine L.L. rapping just to an acoustic guitar. It should be a pretty hype show. Also Yo' MTV Raps now have trading cards featuring your favorite rap superstars. I haven't seen any yet but it was advertised in Rap Masters Magazine. Reached in 2010 via the Facebook, nineteen years after her posting, Ms. Suit was kind enough to agree to a brief email interview regarding her memories of the performance. 1) Sitting here in 2010, what do you remember about the rap episode of MTV's Unplugged from 1991? What I remember most was the music. I was concerned that the beats wouldn't have that swag that it had original recording. I was pleasantly surprised that the music was still bumping but in an organic way. It definitely changed my taste in music. 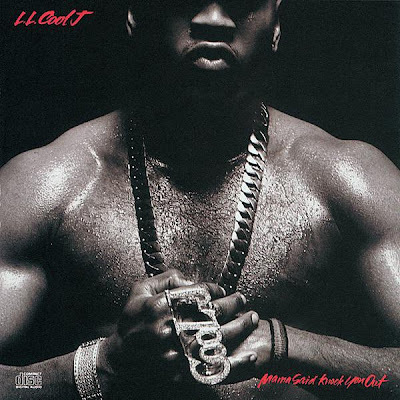 2) What was the reaction to LL Cool J's unplugged performance of "Mama Said Knock You Out"? LL with that shirt off! Loved it hahahahahaha and how he was emphasizing his words on the strong beats - that was hot! 3) What are you listening to these days? I still listen to rap mostly - but I love rappers with crazy wordplay like Fabolous, Outkast, Luda, Jay Z (my fav), just to name a few. I am so looking forward to the Nas and Jr. Gong (Damien Marley) collabo - love he mixture of hip hop and Reggae! "Jingling Baby" was the final single to be released from LL Cool J's 1989 album, Walking with the Panther. The original version of "Mama Said Knock You Out" appeared on his 1990 album of the same name. Interestingly enough, the thrash metal band Scatterbrain would cover the song on the soundtrack to the 1992 film, Encino Man. Two years later, in 1996, Decibel 96 Freaks covered the song on their self-titled album. But the version we here remember best is unplugged. Above: LL Cool J performs "Jingling Baby" on MTV's Unplugged. 1. James T. Jones IV, "The Roots of Rap on MTV," USA Today, May 1, 1991. 2. Wayne Robins, "MTV's 'Unplugged' An Eye-Opener to True Talent," Newsday, May 1, 1991.